In our body, two rates define our body age and how fast we are aging. They are the rate at which our cells wear-out, and the rate at which they renew. The number of circulating adult stem cells largely determines the rate of renewal. Low numbers of stem cells in circulation mean we age more quickly than if we have plenty of them. Other factors include how well stem cells can target tissues in need, and how quickly stem cells can be delivered to them. From the time we were born till about 25 years of age most of us have more than enough Adult stem cells circulating around in our body. These stem cells renew tissues that have aged, or replace tissues that have suffered disease or been injured. When we are young we recover quickly from all that life throws at us. After about 25 our bone marrow slowly becomes more and more ‘sticky’ to stem cells, and as a result, less stem cells are released. This means that the rate of repair and renewal slows down. When the rate of degeneration exceeds the rate of regeneration we start to age. The longer we leave it the more visible the aging becomes and the more we feel it too. The decline in the number of stem cells is one part of the equation. Another factor to consider is the increased rate at which cells die off or lose functionality due to telomere shortening. This shortening happens each time a tissue cell duplicates but speeds up in response to inflammation, stress, and diet-related oxidative stress. 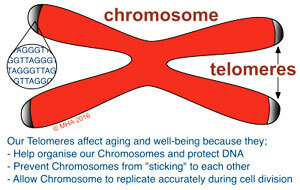 When worn out cells are replaced with fresh new cells created by your stem cells, their telomeres are longer again. This allows the cells to be able to start the cycle as new, young cells again. The decline of adult stem cells can lead to un-repaired damage in virtually any body part, leading to tissue breakdown, aging and loss of health. Without active, vigorous adult stem cells good health is compromised long-term. Scientific anti-aging research shows adult stem cell release rates from the bone marrow drop at an astonishing rate as we age. A baby has adult stem cell circulation of 100% in their blood stream. When a child fractures a leg or has injuries and illnesses, they heal and repair quite rapidly because their system of adult stem cell release into the blood stream is functioning at optimal levels. As we age, repair and recovery slow down. It takes longer to get over coughs and colds; longer for cuts and scrapes to heal; eventually longer to get out of bed in the morning. Part of the reason for this is that our adult stem cells are not released as efficiently from the bone marrow. 65 years – the stem cell release rate has dropped by 90% (leaving only 10% of adult stem cells circulating in the blood stream and this is when we need them the most to fight disease, sickness, and just plain ‘GETTING OLD”! Over time, like a car or any other piece of equipment, our bodies begin to wear out. Stem cell nutrition is a way to maintain optimal health by maintaining optimal stem cell function (like a younger person). The good news is it’s not too late to combat the aging process. Your OWN adult stem cells will fight the “look old … feel old” war. Think about it – have you ever noticed the length of time it takes for a cut or bruise to heal now compared to when you were a teenager? The reason is, you have less adult stem cells circulating in your system now, compared to then. Can Stem Cell Nutrition Slow-down, Prevent, or even Reverse Aging? Stem Cell Nutrition supports three natural bodily functions. CyActiv calms systemic, whole-body inflammation and balances the inflammatory response. Whole-body inflammation contributes to accelerated aging by making it harder for stem cells to find old, worn out, diseased or damaged tissues. Background inflammation makes it difficult for stem cells to accurately ‘target’ and prioritise tissues in need because many areas are sending help signals even if they don’t really need help. Better targeting means the Stem Cells can more easily find where they are needed with less confusion. StemEnhance Ultra Supports an increase in the number of circulating adult stem cells which can become the cells of virtually anything in our body. More adult stem cells mean that more repair and renewal of tissues occurs. They then function like younger, healthier tissues. as a result, we feel better, like when we were younger. Another benefit of StemEnhance Ultra is it support the release of increased numbers of Endothelial Progenitor Cells. These are the cells that help repair the lining of blood vessels and help build new blood vessels. This, in turn, leads to improved delivery of Oxygen and nutrients to our cells, as well as helping stem cells to get closer to where they are needed. 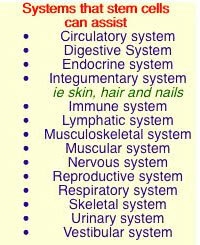 New blood vessels also assist with the removal of waste in our body. PlasmaFlo streamlines the delivery of stem cells several ways. Firstly Plasmaflow is a Fibrin digestor. Fibrin are like hairs in the blood which can form a mesh which can block or slow down the passage of blood and cells to the tissues. This also blocks stem cells from getting to tissues in need resulting in slower repair and recovery. PlasmaFlo ‘digests’ the fibrin and allows the blood to flow more freely. Secondly, PlasmaFlo helps reduce and prevent oxidative stress. Oxidative stress results in more fibrin being produced. Reducing it reduces the amount of fibrin in the blood, improving nutrient and stem cell delivery. Finally, PlasmaFlo supports the growth of new blood vessels, especially the very fine blood vessels known as capillaries. Once again this assists with the delivery of Oxygen, nutrients and stem cells to all tissues of the body.